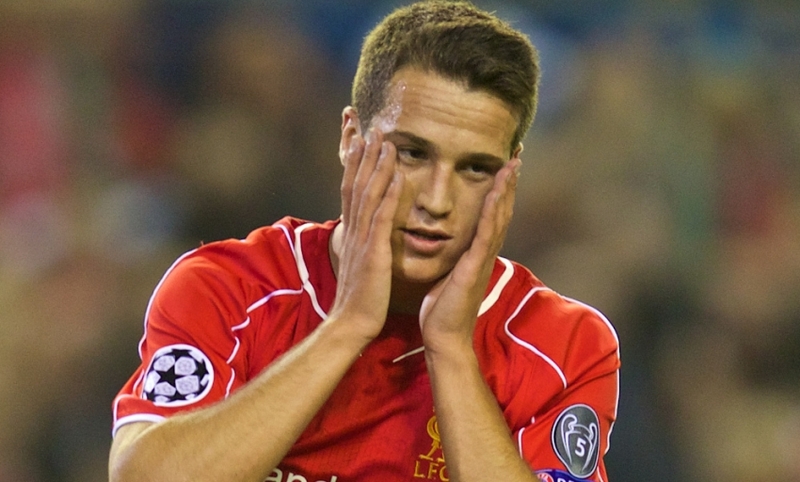 Steven Gerrard, the man so renowned for chasing down lost causes in Liverpool red, struck a last-gasp winner against Ludogorets Razgrad before praising the tenacity of tireless newcomer Javier Manquillo. The Spanish full-back, who refused to relent as the clock ticked down under the floodlights on Tuesday night, was sent tumbling to the turf in injury time by Milan Borjan, the Ludogorets goalkeeper. Anfield erupted when Matej Jug, the referee, pointed to the penalty spot, meaning Gerrard would find himself in an all-too-familiar scenario with the scores tied at 1-1. Bated breath around the stadium; 12,000 expectant sets of eyes on the Kop fixated on him in desperation; a 'keeper poised 12 yards from his path; the chance to seal another memorable win in Europe. Gerrard was unerring in securing a 2-1 victory - and that it was him of all people felt as fitting as the five European Cups on the Kop pre-match, which heralded Liverpool's return to the Champions League after a five-year absence. And after the final whistle brought relief and celebration in equal measure, the captain sought to heap praise on 20-year-old Manquillo from Madrid, who rose to the occasion on a milestone night. "That's the type of defender he is; he's on the front foot, he's aggressive, he's very attacking and he got his reward tonight by being brave and ambitious," Gerrard told Liverpoolfc.com. "Even just being down that end of the field - a lot of full-backs would have been staying back and trying to get a draw out of the game. "But he chased down a lost ball and we got rewarded for it. I think he's done very well since he's come in - not just tonight." Prior to Gerrard's penalty, the loudest cheer of the night - even louder than the roar from the whole ground which followed on from the spine-tingling Champions League theme music - had been reserved for the scorer of Liverpool's first goal. Not least because the strike broke the deadlock on a night when a win was so vital, but because the scorer, with an instinctive slice of his right boot in the 81st minute, was Mario Balotelli, whose perseverance impressed Gerrard on the night. "I think [the goal] will be the first of many," said the skipper. "I thought he worked his socks off tonight. "Sometimes, when it's not going a striker's way, they sulk and they give up, but he was relentless tonight. He stayed in there and the one good chance that came his way, he took it. I thought it was a great finish." The stage had been set, then, for Balotelli to emerge as the hero with the decisive goal in front of the Kop; however, Ludogorets, who had previously struck the post at 0-0, were not about to lie down. Instead, Dani Abalo took matters into his own hands to skip around Simon Mignolet and roll the ball into an empty net in the 90th minute, only for Gerrard's penalty to settle the Group B tie in dramatic fashion. "I was very relieved we got the three points," admitted the 34-year-old. "It was very important to start the competition off with maximum points. "I don't think it was a very good performance from ourselves, but we managed to take the three points, which was vital."